Do you want to come up higher with God and experience numerous blessings? Do you want to impact the world around you and become a walking sermon? A great way to start is by growing in understanding of the fruit of the Spirit. I’m going to break them down to you and hopefully answer any question you may have about them. Imagine traveling through a nature wonderland: orange trees, apple trees, peach trees, strawberry bushes, honeysuckles- anything you can imagine. The aroma would be amazing! Where would you begin? I know I love me some fresh peaches. Mmmm! But then imagine one scraggly tree, withering away screaming “Help me!” Among all the other trees, this one sticks out like a sore thumb. You walk over to it, concerned. It doesn’t make sense why this tree is the only one in a dead state because all the ones around it have abundant life. After analyzing it, you realize you don’t even know what kind of tree this is. There’s no leaves or fruit on it. The bible describes the righteous as ‘a tree of life’. But in Matthew chapter 7, it’s clear that all people are compared to trees, whether good or bad. Jesus told the disciples that ‘by their fruits you will know them (v. 20).’ We don’t want to look like the tree in the description above. We want to be full of goodness that make people flock to us. People should speak well of you and your character. I understand that these things take time; just like a giant thick oak tree in your front lawn. The good news is that great, enormous tree once started as a little acorn. When we become born again, everything that God is enters our spirit in seed form. As we water them with the water of the Word, our fruits begin to sprout. People start to notice there’s something different about you. 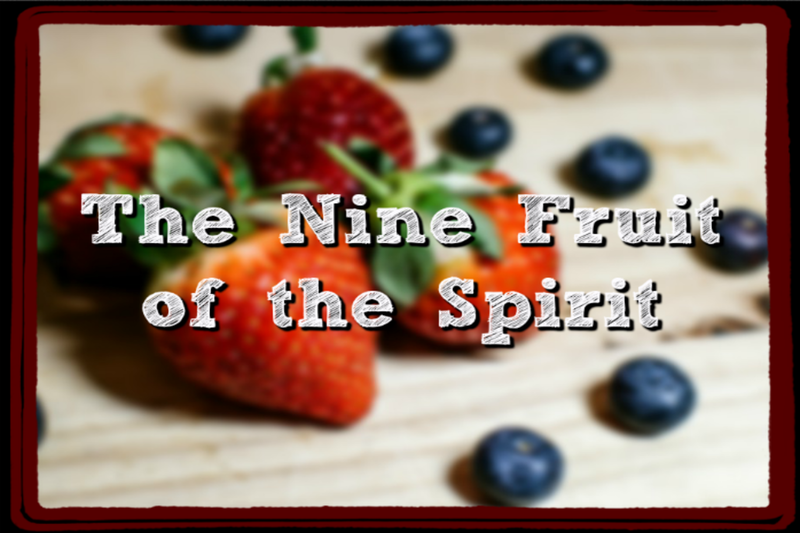 In this post, we’ll explore each fruit of the Spirit to gain a deeper understanding of them and their meaning. The word love in this sentence derives from the Greek word ‘agape’. This kind of love is not centered around feelings or emotions, but it cares for all people. This love seeks the welfare of everyone and would never dream of hurting a soul. Agape love is what God is. It’s more than what’s capable in our human bodies and can only be accomplished by diligently spending time with the Lord. Agape is perfect and unconditional. This is the kind of love that sent Jesus to the cross. The scripture claims that there is no stronger love than the one that motivates a person to lay down their life for their loved one. However, Jesus didn’t lay down His life for His friends, He laid down His life for His enemies. He died for all people, even the ones who drove the nails into His hands. In 1 Corinthians chapter 13, the bible gives a definition for love. This definition explains God’s character and how we can imitate Him. Notice that all the fruit of the Spirit are lists in this scripture above. They all come out of love. If we spend our time learning to love, the other fruits will grow on their own. In the book of Peter, Peter was writing a letter to dispersed Christians across Pontus, Galatia, Cappadocia, Asia, and Bithynia. These humans were facing persecution and many were put to death in heinous ways. Although his letter was about suffering, it offered them hope. He assured them that their faith and deaths were not in vain. Peter was one of the witnesses of Christ’s death and resurrection. In his letter, he said one of my favorite scriptures. “Though now you do not see Him, yet believing, you rejoice with joy inexpressible and full of glory…” (1 Peter 1:8). The Greek word used here is ‘chara’ which means joyfulness. However, it’s a kin to the word ‘chairo’. That word translates into the English word ‘rejoice.” We can rejoice in the Lord in the midst of our hardships because we know that He’s not a liar. He remains faithful even when we’re faithless. Jesus said, “These things I have spoken to you, that My joy may remain in you, and that your joy may be made full.” God wants us to rejoice at all time. Always have a celebratory attitude and be happy! What comes to mind when you think of ‘peace’? Do you think of your happy place? Do you envision a life without struggles? I guarantee that you wouldn’t think of troubling times. Yet, the peace that God gives us is a supernatural state that we can tap into when life makes us want to tap out. When someone hurts us, we tend to attack back resulting in wounds and damaged relationships. God said vengeance belongs to Him and to pray for our enemies. We are to live peaceably with everyone to the best of our ability. The word peace can also mean contentment. It’s possible be at peace during every stage of our life. Although we want to reach our maximum potential, we can still be satisfied to the point that we’re undisturbed. In Ephesians 2:14, in states that Jesus Himself is our peace. He made a promise to us: “Come to Me, all you who labor and are heavy laden, and I will give you rest.” With the Lord as your shepherd, He will lead you beside still waters and restore your soul as you lie in green pastures. There’s no better place to be than the rest of God. Long suffering is another term for patience. More than likely, the last time you had to be patience was during an event you would’ve preferred to not be a part of. We felt some sort of suffering that had to be dealt with. There are many times in life when everyone has to wait, but being patient is how you decide to handle those feelings of discomfort. Although we may be silent, our body language speaks for itself. Let’s try to control our actions and wait with joy. While looking up the Greek definition, another translation popped up. It stated that one who possesses this (patience) has the power to avenge but refrains from doing so. That’s a quality that’s almost impossible to come by. When we are mistreated, the first thing we want to do is figure out a way to get that person back. But patience would feeds our enemy when they are hungry. That’s beyond me! Do you know anyone who is filled with kindness in their inner being and it flows outward into our world? I know some and those people are always a joy to be around. Time flies when you’re with those people. You feel comfortable to open up to them and for some reason you trust them. You know that if you were in need and contacted them, they would help you (or find someone who could). It’s the people that you could never imagine angry and get shocked if you ever witness it. These people are like Jesus. Jesus helped people that others pretended to not see, like Bartimaeus. Bartimaeus was a blind beggar on the side of the road and Jesus and the guys (disciples) were walking past. There was a crowd of people following Jesus out of Jericho. When Bartimaeus heard Jesus was nearby, he began to shout. “Jesus, Son of David, have mercy on me!” The people around Bart kept telling him to be quiet. They probably thought that Jesus wouldn’t waste His time with a man like that. Bart yelled louder. Jesus actually stopped walking. This man caught His attention. He summoned him in front of Him and asked what He wanted. Of course, Bartimaeus wanted his sight and the Lord gave it to him. Bart was a man that many people walked past. I know that because if one person would’ve helped him survive, he wouldn’t have been begging on the street. Someone could have taken him in or showed up daily to feed him. The people around him were telling him to shush it, as if he wasn’t important. However, that was the one man (out of the thousands or so) that Jesus decided to stop for. Also, I want to talk about how the definition above mentions possessing well manners. There’s a lot of stuff on the internet that shows people being very disrespectful to other humans. Although having bad manners does NOT mean a person doesn’t have salvation, it does indicate that they aren’t baring this particular fruit. Since it’s natural to be self-centered, it’s very noticeable when a person is kind to another. It warms the one on the receiving end and has the potential to turn their day in a whole different direction. Plus, people will flock to you because they cherish your presence. They know you’ll make them feel accepted and that you genuinely care. The world need more people like this. If this describes you, then thank you for all you do. We, the people, appreciate you. This is an interesting quality. The word goodness is indicating what morals a person carries. They’re kind towards others. They will stop what they are doing to give a listening ear and offer help. Overall, they’re a good person. Yet, this Greek word also paints a very different picture. It doesn’t have to be used to describe a gentle person. This word can mean someone who is stern when needed. When someone comes to them needing help, they will be strict with them to achieve their goal. Surprisingly, this is the quality that appeared out of Jesus when He was ridding the temple of the merchants and denouncing the scribes and Pharisees. Flipping tables and chasing them out with a whip doesn’t look so loving, but He did it to stand up for righteousness. God must have told Him to do that because in John 5:19 He states He can only do what He sees the father do. God’s character is certainly not bad, but full of goodness. That action can be classified as good because what they were doing was wrong. Jesus was chasing out the bad actions of the temple and cleansing it. He wanted the church to succeed, but success come from God alone, not by selling doves. Flipping tables was His way of teaching them. I’m sure they didn’t forget that lesson. It expands into the belief that God can be trusted. A person who is faithful has full confidence of God and His Word. Since they take God at His Word, they respect who He is and gives Him the honor He deserves. This quality is vital to a healthy relationship with God. Born again Christians are married to the Lord. In the beginning, God said man and woman become one when they marry. However, marriage is representation of Christ and the church. When we accept Christ, we literally become one with His Spirit as He comes to dwell within us. But how long would a marriage last if one of the parties were unfaithful? Probably not long at all. All that would result from this would be devastated families. Treat your relationship with God as if you’re married to Him, because you are! And He loves you very much and vowed to never ever leave you. Humility is a term used to describe someone who does not value themselves any higher than another person. They have the correct perspective that they are small in comparison to God and what He’s capable of. The humble person depends completely on the Lord and knows that apart from God, they can do nothing. I once heard a definition of humility that I think is pretty cool: “Humility is strength under control.” The Lord of Heaven was being tortured and crucified and He just let them (for very good reason). But how easy would it have been for Him to save His own self like the Pharisees were taunting Him to? Instead, He carried out God’s plan and kept His strength under control. Finally, we reached the last fruit of the Spirit. Mastery of one’s self is a way we could word it. This handy skill covers all aspects of a human. Self-Control stretches from emotions to our actions. It includes controlled speech. Usually, this makes itself evident under times of intense temptation or provocation. Wise people are typically very great with this because it takes time to become an expert. A person under control of themselves ultimately controls the outcome of their life. The fruit of the Spirit grow as we seek God and His kingdom first. These qualities are very noticeable by other people and are a great way to pull others to Christ. Not everyone we see will enter a church so it’s important that we are a walking sermon. I hope this list helped you better understand the fruit of the gospel. See you next time! If you have any recommendations for future posts please comment below.